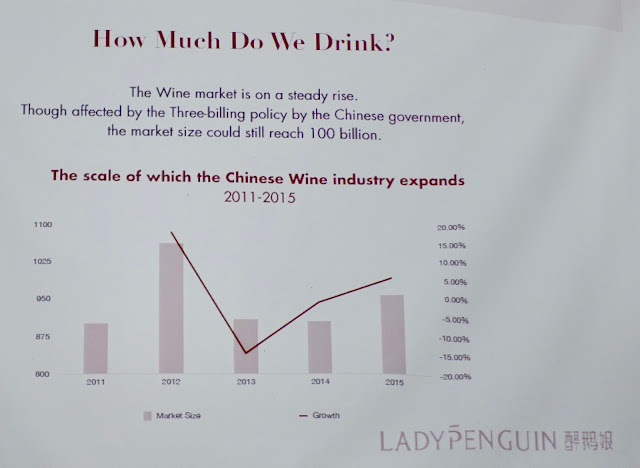 Thanks to consumption by young people -- including teenagers -- China's wine market is bouncing back from the 2013 government crackdown on conspicuous consumption by bureaucrats. 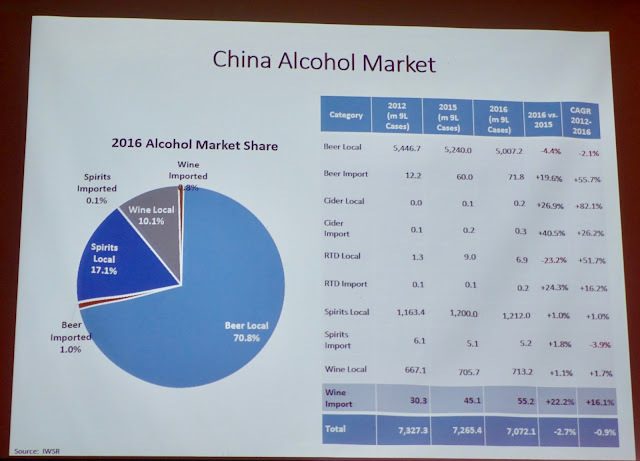 It has also changed immensely in a short time, mainly because of who is buying wine now: 45% of Chinese wine drinkers are under 30 years old. Sales of expensive wines continue to slide, while unlike in the U.S., the greatest sales growth is in the cheapest price ranges. 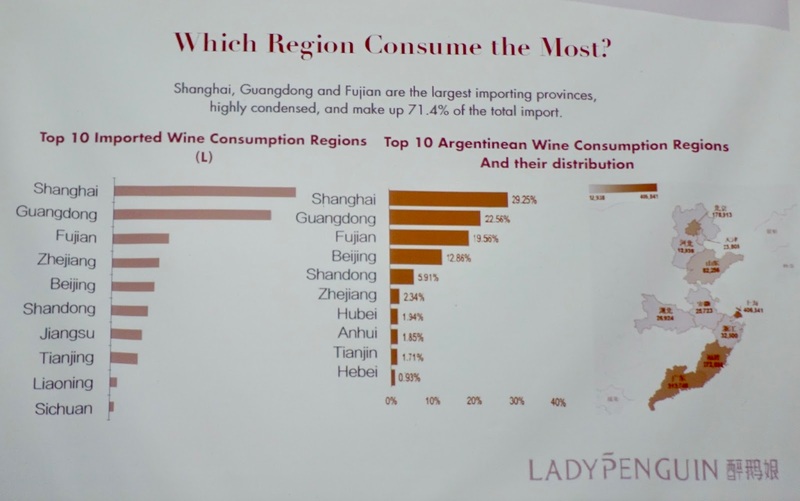 I learned this and more because I had the good fortune to attend a seminar put on for Wines of Argentina by two Chinese wine experts: Dorian Tang of the importer ASC Fine Wines, and Karla Wang of Lady Penguin, a successful social-media wine site, wine club and wine importer. Here are a few key points from the presentation. * Australia has made a big move into China, buoyed by China's new interest in cheaper wines. Australia shipped 31% more wine by volume in the last year alone, and it's already the second-largest exporter to China after France. * However, the average bottle price of Australian wine in China plummeted. Look at the unit values above. 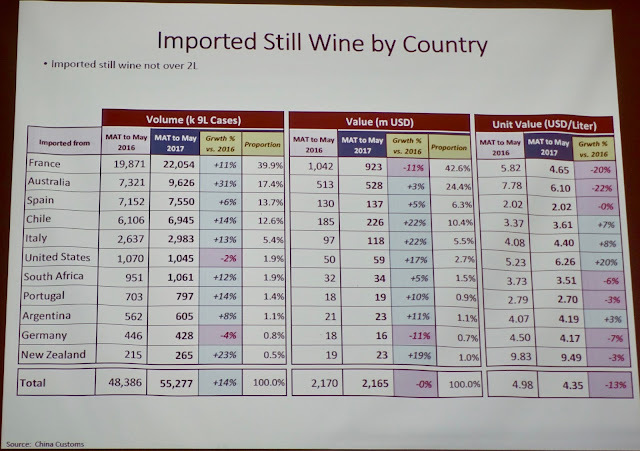 Keep in mind that these are the prices at which the wines enter China, before duties of roughly 48% for most countries, and also before retailer markup, which varies widely. (I'm going to use a rough average of 30% for the figures below.) Australian wine's average bottle unit price dropped from $5.84 to $4.58 over the last year. Imagine producing, bottling AND shipping a wine to China, all for $4.58. * Thanks to Tang's helpful translation to Euros, you can see that more than half of the wines sold in China cost €6 to €12 (or roughly US $7 to $14). * Sales of expensive wines over $56 continue to drop and now make up only 0.3% -- not 3%, but less than one in 300 bottles. If you read mainstream media coverage of wine in China, you would think it's all Lafite-Rothschild and Opus One. The media's ongoing obsession with sales of expensive Bordeaux in China misses what a small part of the market they are. * So, back to unit prices. Australian wine's average unit price dropped from $5.84 to $4.58 over the last year. Australia has a free-trade agreement with China to reduce tariffs, but that still puts the average retail price of a bottle of Australian wine in China at just over $7. And these are averages: for every bottle of Penfolds Grange that sells in Shanghai (and it does), a lot of really cheap wine sells to balance it out. 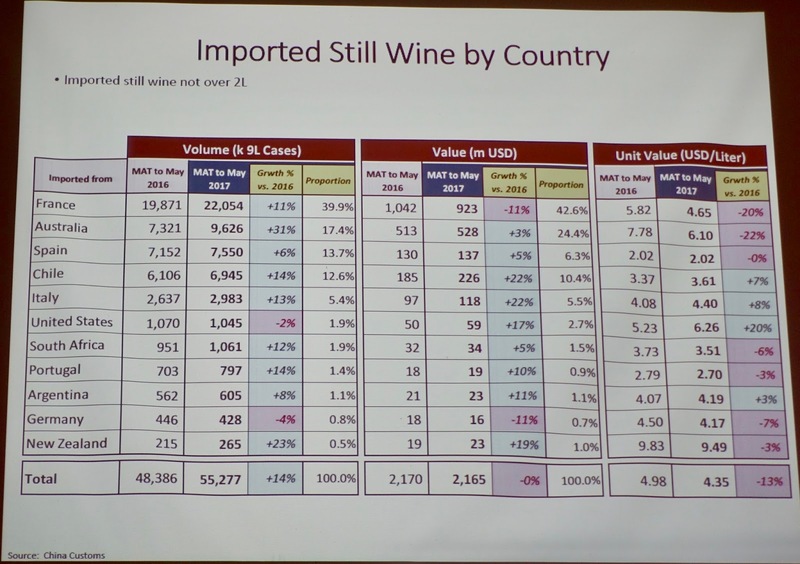 * If you really want to understand how cheap the wines Chinese are buying are, consider that Australian wines are still the third-most expensive foreign wines to import after New Zealand ($7.12) and the U.S. ($4.70). * Without a free-trade agreement, U.S. wines' average retail price are about $8.50. * For some reason the U.S. is one of the few countries to buck the recent trend of selling cheaper wines. U.S. wine imports went down very slightly over the past year, but the average bottle unit value actually jumped from $3.92 to $4.70. That said, the U.S. accounts for less than 2% of wine exports to China. * Stepping back and looking at sales of all alcoholic beverages, imported wine is still a rarity, especially outside of the wealthy southern coastal provinces. 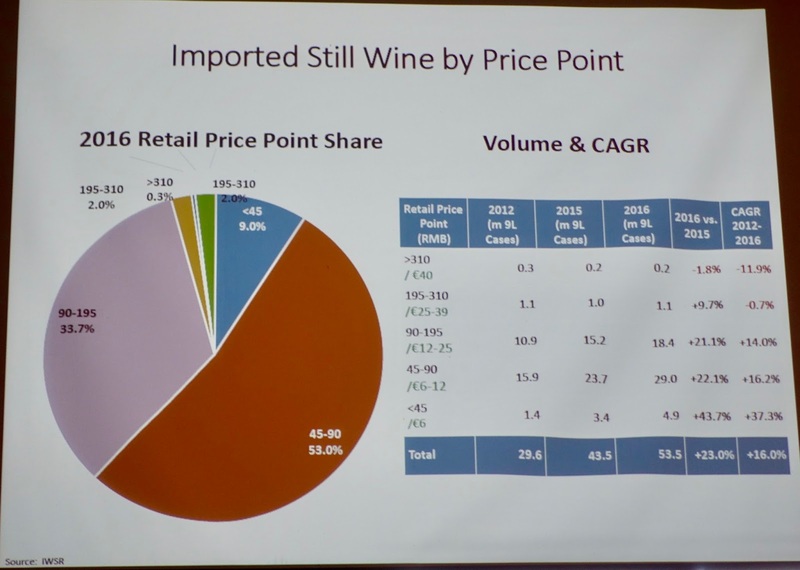 Imported wine is less than 1 percent of the overall alcohol market. Chinese beer dominates at 71 percent; Chinese spirits like baiju are next at 17.1%. * While sales of imported wine and especially beer are growing rapidly from a small base, sales of imported spirits are actually dropping. Wang said this is a result of the government consumption crackdown. It's no longer expected to give a government bureaucrat a bottle of XO Cognac on every visit. * The age of drinkers is really interesting. An astonishing 14% of wine consumed in China is drunk by people under 19 years old. 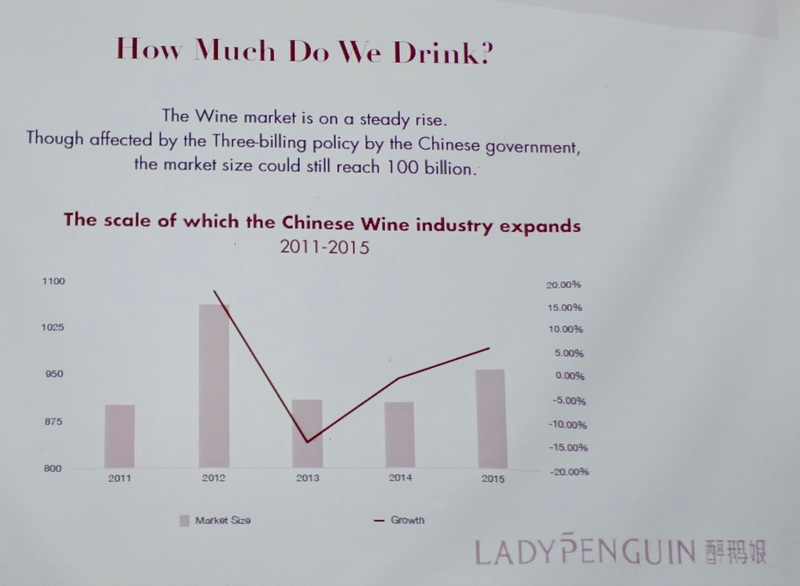 * Wang only broke down the figures for Argentine imports, not all imports, but it's notable that nearly a third of Chinese buyers of Argentine wine are age 25 or under. This indicates that younger people are more interested in trying exotic foreign wines, which must be good news for pretty much every wine exporting country with the possible exception of France. 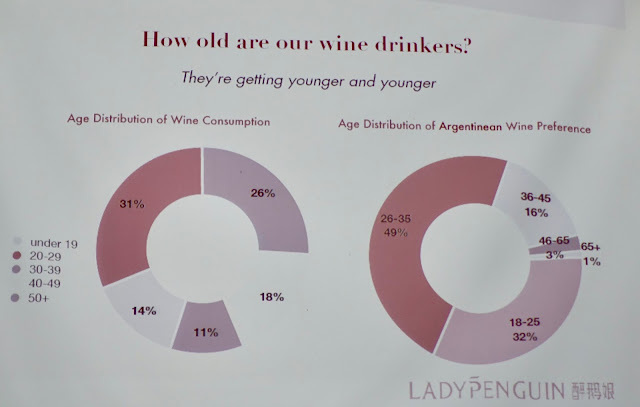 * You might think a site called "Lady Penguin" would bring more female wine drinkers, but she said her membership is about 50-50 between women and men, and she believes that reflects the national wine market. * Wang said young Chinese people buy things with their smartphones more than any other country (she went to Brown University, so she knows about U.S. millennials and smartphones). 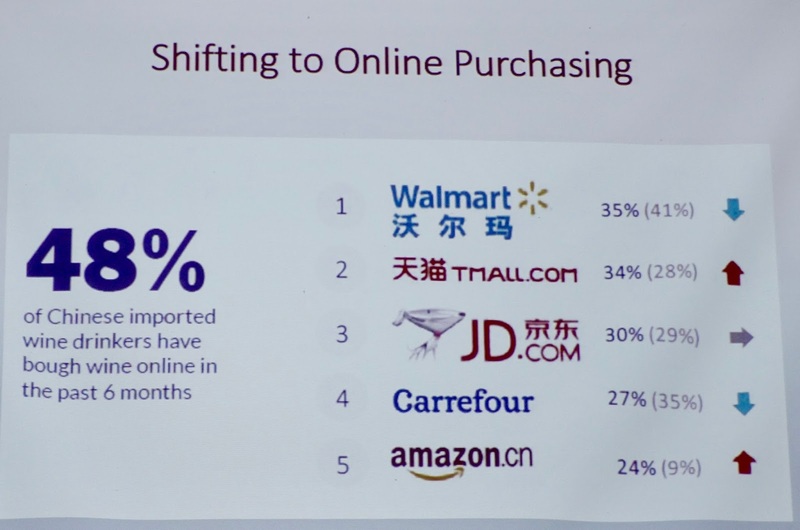 Nearly half of all Chinese consumers of imported wine have bought wine online in the last six months. * Last but politically not least: Free trade agreements really matter. Chile sells 11 times as much wine in China as Argentina. Wang says this is not because of quality or reputation but because China and Chile have a free trade agreement that makes overall tariffs on their wine 1/3 lower than those of Argentina. Coupled with higher shipping costs -- Chile's main ports are on the Pacific Ocean whereas Argentina's are on the Atlantic -- Argentine wine in China costs at least 25 percent more than Chilean. Right now, price matters.